The Broholmer, also known as Danish Broholmer and Danish Mastiff, has been dated back to the late 1500's. The daughter of the Danish King, King Frederick II, married the Scottish King, King James VI. King James VI gave English Mastiff-like dogs to the Danish royalty as a gift. Also, the legendary Danish Vikings, at times, would bring back Mastiff type dogs from their travels during the Middle Ages. 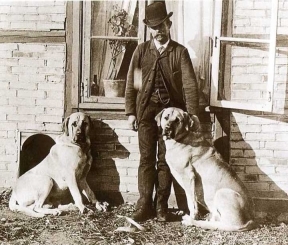 These dogs then were mated with local drovers dogs known as slagterhunden or "butcher's dogs". These offspring are referred to as the Old Danish Dog. These dogs are regarded as the start of the Broholmer breed and are also considered as the "real" Great Dane. 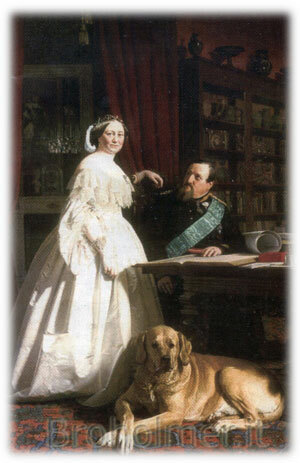 The Old Danish Dog was revered by the Danish royalty and aristocrats. These dogs were commonly given as gifts to royalty and aristocrats of other countries around Europe. They were used for guarding castles and estates. They were also used widely for looking after herds and were big, fierce hunting dogs used mainly for stag hunting. As hunting methods changed, the need for large breed hunting dogs diminished. The fierceness and hunting instinct were bred out of the breed. In time, the Old Danish Dogs became calmer and were only used as guard dogs for castles, estates and large farms. As time went on, the care of such a large breed dog became very expensive. The expensive upkeep, along with the change in hunting methods, led to the decline in interest for the Old Danish Dog. 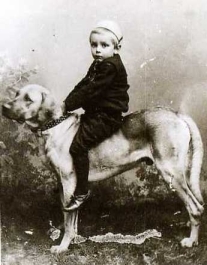 By the mid 1800's, the breed was almost extinct. himself to protect this revered breed from extinction. He set up a breeding program to help this once abundant breed thrive again. To promote his program, he presented puppies to people within Denmark, but only if they promised to follow his breeding program. After decades following his strict breeding guidelines, the breed's features standardized and became more defined. Also, the breed began to flourish again. This dog breed was now much appreciated by all social classes, not just aristocrats. Because of his commitment to the breed and inspired by his residence, the Castle Broholm, the breed became know as the Broholmer.